Day 4: Dr. Cruz in Chinese class! It's awesome to have a superintendent who uses the power of Twitter to share the great things going on in our large district. It's even more awesome when Dr. Cruz comes to visit! He brings such a positive attitude to every class he visits and interacts with the kids in such a genuine way. It's almost like he's just a big kid himself (in addition to doing all that adult work he does nonstop). 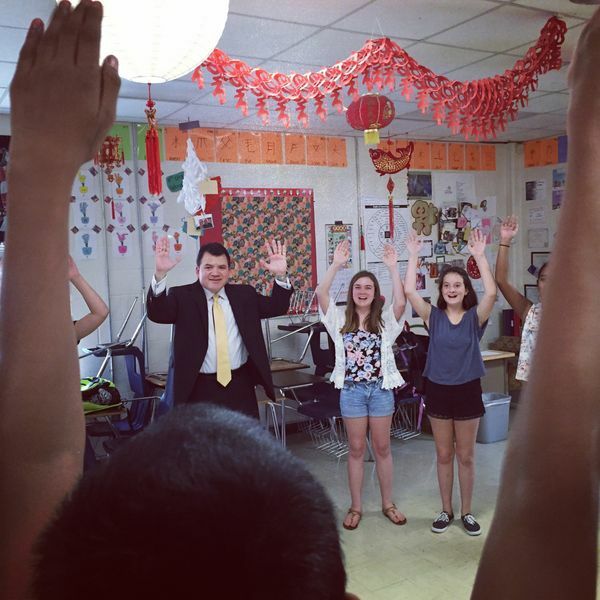 This picture is a snapshot of Dr. Cruz participating in Ms. Stringfellow's Chinese 2 class. And here's the link to a video of Dr. Cruz really trying to fit in with the class activity that I posted to Twitter. Thanks for visiting Dr. Cruz! I'm #AISDproud to have you as our leader!